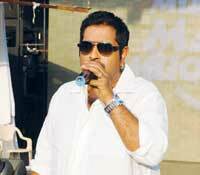 Joining Shankar Mahadevan on his successful musical odyssey are his two talented sons. We catch up with Shankar Mahadevan and his two budding offspring over a cup of tea at the third edition of the Storm Festival, on the outskirts of Bangalore. Pushing 50, the youthful, down-to-earth musician wears his fame lightly as he talks to us about his various passions, Storm as a strong platform to promote music apart from Bollywood and the start of a new Mahadevan chapter through gen next. 1. As a foodie, what is your favourite dish? Every day my favourite is different. Food for me is as important as music. That is like pickingA�a favourite child.A�I cannot. I will say this openly. I loveA�Lungi Dance. One million of them. I listen to every genre of music so eachA�section has a few people whoA�influence me. The list is endless. My wife. She makes my life musical. And herA�name is also Sangeeta. companion. Sometimes, it is hard to keep working at it. But when you put all your passion into it, you will be rewarded, even in the current climate of instant viral success when musicians can find fame overnight,a�? he begins. And although he has several awards from national to state and industry levels under his belt, he modestly insists that it is his connect to the masses that gives him the most satisfaction. a�?Not that awards dona��t mean anything. They do give you that validation and encouragement. They even recharge your batteries at intervals. But merely winning an award does not mean youa��ve arrived. Sometimes we forget them as quickly as we win them… the very next day even. But when the guy pushing my trolley at the airport says the song Maa moves him to tears, that right there, is my biggest award,a�? he tells us, the conviction in his voice coming through even as he glances at his sons, Siddarth and Shivam, with a mix of nervousness, excitement and paternal pride. The young lads were gearing up to take the stage at the Storm Festival in Bangalore, and Shankar is a tad cautious about their burgeoning music careers. He even insists that he had no part to play in their decision to go professional, although agrees that since they grew up surrounded by music, it was an inevitable outcome. a�?I was very encouraging of anything they did when they were growing up, although my wife used to feel I didna��t spend enough time with them. So you see, pressurising them to become musicians was out of the question,a�? he laughs, adding, a�?they are both just beginning. They have a lot to learn and experience. But I am tremendously happy that some of Siddartha��s songs have already become popular. He has worked hard on it. Fame is an encouraging factor, no doubt, but I believe that their musical aesthetics and tastes are in the right place. Based on that, I think and hope they will sustain their momentum for a much longer time.a�? With over 2,000 students from 34 countries, the Shankar Mahadevan Academy reflects theA�singera��s passion for music. Offering 150 plus courses for children and adults, there are also 14,000 virtual classes. a�?My aim is to reach out to as many people and promote music other than Bollywood. I want to make learning of all styles of Indian music easy, accessible and attractive to people worldwide. There is tremendous amount of talent waiting to be discovered,a�? he says. Not yet a teenager, 12-year-old Shivam Mahadevan has sung for films like Dhoom 3 and his version of Bande Hain Hum Uske caught people off-guard, pleasantly. a�?For me, Dad is like a God. Singing for me is my father. There is no comparison. Hea��s the best,a�? he enthuses, adding, that he gets his brother to download Daddya��s songs from a long time ago. a�?I listen to all his old tracks. Like the ones from Mission Kashmir, before I was even born.a�? Like most siblings, Shivama��s tastes are very different from his brothera��s. Something that their father takes pride in, for his kids have a�?followed their own instincts and have courage to be themselvesa��. a�?He (Siddarth) is more about rhythm and rock. I like melodious, classical music,a�? the youngster says, revealing that Shreya Ghoshal would be his dream collaboration. And that balancing school and music is quite a cinch. a�?Music, school, friends and family are all important. They dona��t clash at all,a�? says this young Saili Kalyanpur disciple. a�?Unfortunately shea��s moved to LA. But I refuse to learn from anyone else so I train with her on Skype,a�? he says gleefully. Shivam will next be heard on an album collaboration with Lesle Lewis. Siddarth too is part of the album which is a tribute to the guru-shishya relationship. Expect this firecracker to even don the composer hat in the future. a�?But only after I master singing,a�? Shivam signs off. Over 15,000 songs from various genres but most recently the entire Grammy set list. I love the new EDM stuff and I like Royal. Michael Jackson. Hea��s a true and complete artist a�� be it singing, composing, dancing, stage production or performance. Literally a dream. I pick Michael Jackson. 4. OST you wish you were part of. She binds the family. She isna��t a musician but her opinions are sometimes more important than dada��s. Watch out for him. He is goingA�to arrive with a bang. simultaneous debuts a�� Zinda and the rock version of the title song Bhaag Milkha Bhaag. About his big break with Zinda, he tells us that it was almost by luck that he got the gig. a�?My dad is always telling me to sing this song or that. He doesna��t use his clout to pull strings but he has no issues when he pulls my leg, insisting I should sing all his songs! He called me in to just listen to the track, and it was amazing. I instantly fell in love with the sheer power of the song,a�? he shares, adding that the director, Rakeysh Omprakash Mehra finally decided to give him the song. Siddarth shrugs off the celebrity kid tag quite determinedly, insisting that the whole family is very a�?chilled outa��. A typical Sunday at home generally pans out with dad cooking up a storm in the kitchen, mom watching a film with the kids as artsy, musically inclined friends drop in and out. a�?I played percussion, sang and even fiddled about with the harmonica growing up. Dad didna��t force me into anything but encouraged me to do what I enjoyed. And to be original,a�? he tells us. Being compared to his father, Siddarth says was also inevitable. a�?I take all the comparisons in my stride because I am being compared to a legend, who just happens to be my father. It sets the benchmark high and makes me want to do better,a�? he admits, but emphasises that he landed the gig in the Dhoom 3 hit song Malang on his own merit. a�?Actually, Aditya Chopra asked Aamir Khan to listen to a few recordings (including mine) and pick one. Aamir picked mine without knowing who I was.a�? Then he goes on to tell us that winning the RD Burman Award for New Music Talent at the Filmfare Awards was the most amazing moment of his life. And also the most a�?horriblea��. a�?I was so thrilled because former winners are all people Ia��d always looked up to, including Shankar-Ehsaan-Loy. I was shaking with nerves, hoping they wouldna��t ask me to sing. But they did! So it was horrible in that sense.a�? Siddartha��s latest release is Ia��m Just Pakaoed from the film One By Two, a�?It was the best experience. The lyrics are mad. The energy is crazy,a�? he smiles, adding that we can expect him to do quite a bit of composing as well because a�?picking between singing and composing, is like deciding between one of my eyesa��. Without revealing the names of the films, Siddarth hints that his voice will power a few Bollywood numbers in the near future, while finishing his education too, is on the cards.